So You Want To Put On A Show!! 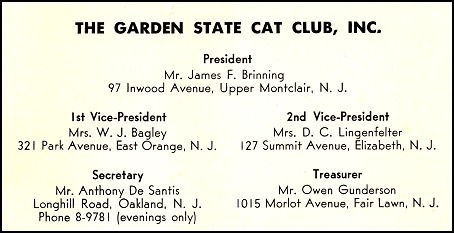 The graphic images and ads were scanned from a copy of a 1950 show catalog from Garden State Cat Club. 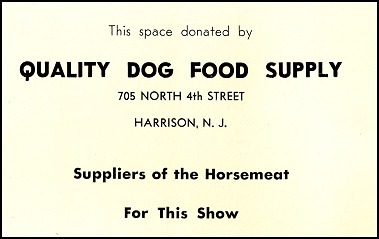 This was a CFA show, held on November 1-2, 1950, and was their 12th Annual Show. 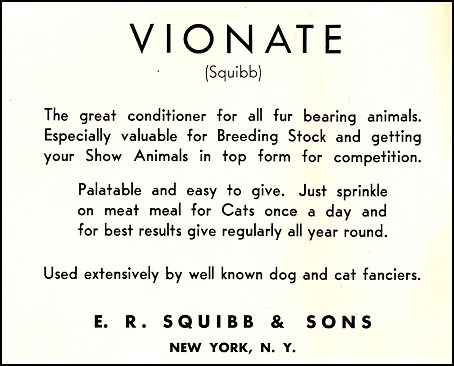 The catalog cost 50 cents at the time, and in addition to listing all the competitive entries, had numerous ads from both breeders and commercial advertisers. Shop around for your showroom. Get bids and submit same to your Club for approval. Try to have a showroom that will be large enough to be comfortable. A small, overcrowded room makes for short tempers and nervous cats. You must have at least two stages if you are having one or more Specialties. If at all possible, set up a third stage if a third judge is being used. This will keep the show moving. The judging area should, preferably, be roped off from the spectator’s seats and the clerk’s table is best placed at least five feet away from the judge. Visit several printers and get their bids on your catalog. You will be surprised at the difference in prices, quite often for the same grades of paper. Use a good grade of paper so that the exhibitors can mark their catalogs in ink. The catalogs should also be firmly stapled together. The printer will give you the time limit for printing your catalog, and this will govern your closing date of entries. However, as your advertising copy arrives, it may be taken to the printer and that much completed before the catalog’s closing date. it was common for the closing date of the shows to be 4-5 weeks ahead of time. The show manager will order the cages, having ascertained from the catalog the number that will be required. In some locales these may be rented from the local fair grounds. If at all possible, there should be 15 to 20 judging cages for the All-Breed stage and 10 to 12 for each Specialty stage. The judging cages should open front and back. Oilcloth is preferred underneath the judging cages as this may be sponged. Paper, with its absorbent qualities, retains stud odor, even though changed and sprayed. Your initial expense will be more, but the results will amply repay you. Be sure to have a disinfectant that deoderizes as well as disinfects. There are many satisfactory ones on the market. There should be two enamel or plastic pans with sponges on each judge’s table, one with disinfectant for sponging the table, and the other for green soap solution for the judge’s hands. Some judges like small hand towels rented from a linen supply service, others are satisfied with paper towels. Have ample sprayers to clean cages after sponging. Nothing can be more exasperating than to be continually searching for the sprayer. Have at least two stewards for each judging stage to clean, change cards, etc. They must be well supplied with disinfectant, sponges, sprayers, etc. Exhibitors are more likely to bring a larger number of cats if they can count on assistance in unloading. For a nominal sum, high school boys are glad to help. Have them on the job before check-in time, and again at close of show. You will need at least 9 ounces per cat. This will take care of three feedings, one Saturday, and two Sunday. However, remember when ordering to make allowances for absentees and exhibitors who prefer to bring their own food. It may be possible that one of your local distributors will be happy to furnish the meat in return for an ad in your catalog. Times have certainly changed a LOT in regards to the food issue! to provide food for all the entries?? Have a large ladle to dispense the horsemeat and paper plates to put it in. Be sure to assign one of your members to this task, this way you can be sure that all receive the same amount. Use one of the commercial litters. Here again, one of the local distributors will be glad to furnish same, and possibly disposable pans, also. If your show is held in a park or Fair Grounds it is wise to have directional arrows guiding both exhibitors and public to the showroom. You should have bunting to tack along the sides of the tables holding the cages. This can be burlap, muslin, etc. Generally, the bunting must be fireproofed. Your fire marshall can advise you on this. Check with him at least a month prior to the show. Try to avoid paper bunting as it will tear and present an unsightly appearance. Be sure to cover your judges, stewards, and handlers (if you are using them) with insurance. For public liability, one of your local insurance companies will take care of you. Have your Vet in attendance in plenty of time. In some instances, he can be available Friday night for people who might wish to bench their cats then. Be sure to check whether or not there is an additional charge for the extra time. Have a pan, disinfectant, and paper towels available for him. Cats would actually spend the nights in the showhall at the time! Have plenty of tacks for the posting of the judges slips, etc. You will need a good staple gun for fastening the bunting to the tables. Your printer can print your tickets if you wish. If the admission is over $1.00, the total breakdown must be printed showing admission charge and federal excise tax, plus city tax. If this is the case, be sure and save the first and last tickets to account to the internal revenue service. Every ticket must be accounted for. In this locale, to be exempt from the city tax, we apply for a solicitations permit from the Department of Social Welfare. The attendant will ask various questions, filling out a form which the show manager signs, stating that you are a non-profit organization, and, if the show is a success financially, the Club will donate as much as possible to a worthy cause such as the Humane Society or the Polio Foundation. Design and have your printer make up posters to be distributed to Pet Shops and as many other public places as possible. Try to have these out at least a month before the show. A publicity chairman is a must. It pays to advertise on radio, TV and in your local newspaper. With newspaper feature stories the best method is to write your material and send it to the City Editor. Submit photographs if available. Do not be disappointed if your article does not appear immediately. If you are acquainted with the editor or reporters, possibly you can present your material personally. Be concerned with the comfort of both exhibitors and spectators at all times. Remember that, in many instances, exhibitors have travelled great distances and are naturally weary. Spectators will ask innumerable questions; some may seem silly to us old seasoned exhibitors, but remember that the people who ask them may be future exhibitors and, even if not, they are sincere. Undoubtedly they will tell us all about their precious baby at home that is far more beautiful than any present in the showroom. So go along with them; it never hurts us to be gracious. Hmm - 50 years later, and some things are still exactly the same! If at all possible, it is advantageous to have some event in which the youngsters can participate. Here again let us remember that some of these are the breeders of tomorrow. At the door (where the tickets are taken) have available a notebook, pencil and paper, and a small sign – “Register for next year’s Show”. Here many interested parties will register for the following year. This year they did not know about the show until too late to make an entry, but would like to do so later. Perhaps they have only a household pet, but, to them, that pet means as much as our show stock to us. There is often one mike available with your showroom. The others for the Specialties you will have to arrange for. There are many agencies or private parties that do this for a nominal fee. Have on hand a well stocked first aid kit with disinfectant, bandaging material, etc., and someone who is skilled in their use. Have several trash containers throughout the show room for rubbish. Advise the exhibitors at intervals to please use same so that the showroom will be kept neat and tidy at all times. There should also be a “cleanup crew” to sweep and see that the trash containers are emptied at intervals. Exhibitors appreciate clean and well supplied Rest Rooms. It is most important that they be inspected frequently. Some exhibitors and spectators will order marked catalogs. See that an accurate list is kept of these, and that they receive them promptly. Have your official show photographer on hand and advise the exhibitors and public, by microphone, of their presence. By all means have a grooming room, two if at all possible. Here the exhibitor can retire and put the finishing touches on his or her exhibit. Grooming was done in a separate room, rather than at the exhibitors' benching area. You will need blocks to hold the number cards on top of the judging cages: 2” x 4” cut the size of the card with a slanted slit in the center. The cage cards must be large enough so that the numbers can be seen easily. A great help is to have the number somewhat smaller on the reverse side and the word “Out”. When finished with the particular exhibit, the judge or clerk will turn the card and the exhibitor knows she may pick up her cat. This saves a great deal of time. An empty cage must be left between every two males in the judging ring. A separate record should be kept of all monies received; entry fees, ticket sales, catalogs, trophy and ribbon fund; double cages; etc. Try to have some decorations in the showroom such as plants, etc. Local nurseries will rent them. It is most important to have adequate lighting over the judges tables. Lights over the judging cages are desirable if at all possible. At last the final ribbon is hung and the show is over. Some are happy – some are not. Remember we cannot all win and rarely to two people see things alike. The judges will submit statements for expenses, judging fee, etc. The treasurer should be on hand to take care of this. Remember to remove all judges slips from the bulletin board. These will be filed with the marked catalogs for the Club record. They will also be handy should any changes or corrections be necessary. Gather the show equipment, i.e. utensils, sprayers, cage cards and blocks, banners, oilcloth (if such was used), bunting, etc. Have these all together as it is very easy to misplace such things at this point. The breaking down of the show hinges on the time alloted to you by the manager of the building. Some will permit you to wait until the following morning, but others insist that this be done by midnight or an extra charge will be made. If you have the same crew to dismantle cages and tables proceed as per your time element. Be sure and check your cages, counting number to be returned. This should also be done when they are brought into the showroom. It is very easy for mistakes to occur, and, unless you check carefully, you may find yourself charged for cages you did not receive. Have floors thoroughly clean and free of all debris. Leave the showroom as neat and clean as it was on arrival. You may want to use it another year. Within five day submit to the Recorder marked catalogs plus the listing fees. One marked catalog must be sent to the Association Secretary, also the All-American Scoring Sheets and catalogs to the All-American Scorer. Mail all statements and catalog as proof of copy to advertisers. Wrap securely and return all advertising cuts. The show secretary will order from the Ribbon Company any ribbons that were omitted and send them to the proper exhibitors. Fill out the form and return it to the Department of Social Welfare if it was necessary for you to use one. Mark and mail catalogs to those who have ordered them. Try to do this as soon as possible. At times it is months later when the exhibitor receives same. For your Club records, you will have the amount of cash receipts; door, catalogs, magazines, etc. Perhaps you will soon be planning another show! The time to plan your next show is immediately after the last one.